The US Committee for Camp Ashraf Residents (USCCAR) has issued a statement, expressing its outrage at the White House’s failure in holding Iraqi government of Nouri al-Maliki accountable for the September 1 massacre of 52 defenseless residents of Camp Ashraf. The US Committee for Camp Ashraf Residents (USCCAR) deplores the failure by the White House to hold the Iraqi government of Nouri al-Maliki accountable for the September 1 massacre of 52 defenseless residents of Camp Ashraf, members of principal opposition People’s Mojahedin Organization of Iran (PMOI/MEK). The State Department has maintained that it ‘has no credible information indicating that the Government of Iraq was or is involved with any activities regarding the abduction or detention’ of the seven residents of Camp Ashraf during the massacre. The facts suggest otherwise. Hours after the massacre, CNN quoted ‘Two officials with Iraq’s Interior Ministry’ that ‘security forces raided Camp Ashraf’ and Reuters, quoting ‘two Iraqi security sources,’ added that ‘the army and special forces had opened fire on residents.’ Photos and video clips of the scenes of massacre also confirm these reports. During an October 3, 2013 hearing, the Senate Foreign Relations Committee Chair, Senator Robert Menendez (D-NJ) and Senator John McCain (R-AZ), made it palpably clear to the State Department that US military and security assistance to Iraq would be in jeopardy if the Iraqi government brings any further harm to the 3,000 residents at Camp Liberty or refuses to release the seven hostages, about whose whereabouts it is aware. While the Under Secretary of State for Political Affairs Wendy Sherman acknowledged the US needs to get the residents ‘out of the harm’s way,’ in order ‘to make good on the word we gave to the MEK,’ the administration still refuses to take the necessary actions to secure release of the hostages and ensure protection of the residents at Camp Liberty. The flip side of the reluctance to hold Iraq accountable is the administration’s inexplicably enthusiastic outreach to Maliki’s closest ally, the Iranian regime, whose officials have declared in no uncertain terms that their objective is to eradicate the MEK, which poses an existential threat to the ruling theocracy in Iran. 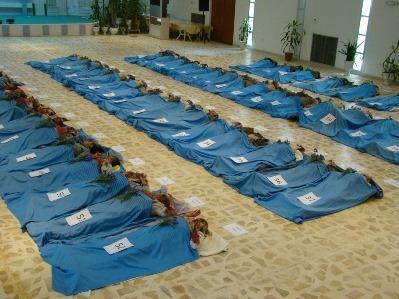 Previous Previous post: Will Obama let the 7 hostages share the Fate of the 52 Victims of Camp Ashraf Massacre?